Move well. Eat well. Be well. "If you treat an individual as he is, he will remain how he is. But if you treat him as if he were what he ought to be and could be, he will become what he ought to be and could be. " Now available - a revolutionary approach to treating pain and inflammation without drugs or needles. Amino Neuro Frequency Therapy ("ANF") uses wearable technology to help normalize functions in the body thereby reducing or eliminating pain, inflammation, and increasing function. An FDA registered Class 1 Medical device, ANF discs are only available from trained, qualified practitioners. Find out more about ANF Therapy at www.anftherapy.com or contact Melissa Seipel, ANF6, for more information. ANF - "When nothing else works!" 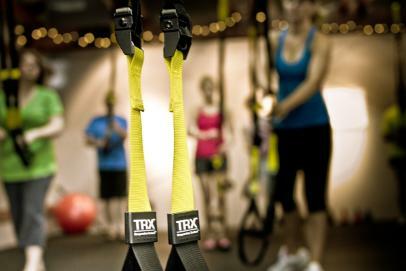 Located in West Olympia, Washington near the Capital Mall, Impact Fitness is South Puget Sound's FIRST TRX-based functional and restorative movement training studio. Our mission is to support you in getting into the best shape of your life with our holistic approach to health and wellness. We believe that improving functional movement leads to more valuable benefits from exercise as well as improved overall health. Ready to enjoy greater health, higher energy levels, and optimal physical wellness? Our programs are proven to assist people of all ages, sizes, and fitness levels to attain improved well-being, strength, and improved health through personal training, group training, health coaching, myofascial release, holistic therapies, and nutrition guidance. We offer all new clients a FREE Introductory Session to take us for a test drive! Contact us to set up a time to stop in and see our facility and learn more about our programs - or go to our Online Schedule and click on the Appointments tab to see TRX Intro, Personal Training appointments and the Classes tab to see Group Training session availability. Our Personal Trainers are certified through the highly-regarded National Academy of Sports Medicine (NASM), and are experienced, educated, fun to work with, and completely professional. Our trainers also have certifications including Amino Neuro Frequency Therapy, StrongFirst Kettlebell Instructor, NeuroKinetic Therapy Level 2, RockTape Fascial Movement Taping (FMT) Specialist, and Corrective Exercise Specialist. Our programs are designed to restore and improve movement and rebalance muscles and strength, thereby reducing the risk of injury and increasing function. Our facility features state-of-the-art equipment and is clean and comfortable. We offer a free Introductory session to all new clients, as well as a nutrition program through our partner, Whole9, at no additional cost. Hope to see you soon! Click here for more information about our Programs. See what our clients are saying about Whole9 and the Whole30 Nutrition Program Free for All Impact Clients!